The culmination of 18,000 hours of work over three years, the truck features a cab that is 100% carbon fiber, active grille shutters that open based on temperature, an aerodynamic tail and a 5,000-watt solar panel array on the trailer roof that powers equipment such as blower motors, windshield wipers, gauges and air conditioning. It also features a downspeed axle configuration and hybrid-electric axles that replace the rear nondriven wheels to provide a power boost when the truck is climbing grades, Shell said in a release. The truck’s mission is to demonstrate that the global challenges of reducing CO2 emissions while also meeting the demands of global population growth, urbanization and strong economic development can all be reached, said Megan Pino, Shell Rotella global brand manager. “We see the Starship Initiative as a material demonstration of how we can work together to realize these reductions in energy demand and CO2 emissions today,” she said. Pino noted that since transportation is responsible for 35% of all energy consumed globally, it is a natural area on which to focus when seeking to realize efficiencies. The truck is powered by a 2017 Cummins X15 diesel mated to an Eaton automated transmission, and sits on the rolling chassis of a 2016 International ProStar, said Bob Sliwa, president of Airflow, which built the truck. A former owner-operator, Sliwa began experimenting with fuel-efficient truck designs in the 1980s, building his first design in 1983 and a second in 2012. The more recent effort, called the “Bullet Truck,” returned 13.4 miles per gallon during a coast-to-coast trip hauling 65,000 pounds, Shell said in a release. Sliwa said he initially began experimenting with fuel efficiency during his driving days when he became frustrated with the poor fuel economy he was receiving. As for building this latest truck, he said other companies turned him down before Shell expressed interest in the project. “I’m a 35-year overnight wonder,” said Sliwa, who drove the truck to TMC. But the truck also places a premium on safety, noted Shell Global OEM Technical Manager Dan Arcy. “Underpinning all of this is safety,” he said, pointing specifically to anti-lock braking, stability control, a radar system on the front and other safety systems on the truck. The truck will use low-viscosity Shell lubricants to reduce friction in the drivetrain, the company said, along with an automatic tire pressure monitoring system to ensure proper inflation, as improper tire inflation can hurt fuel mileage. 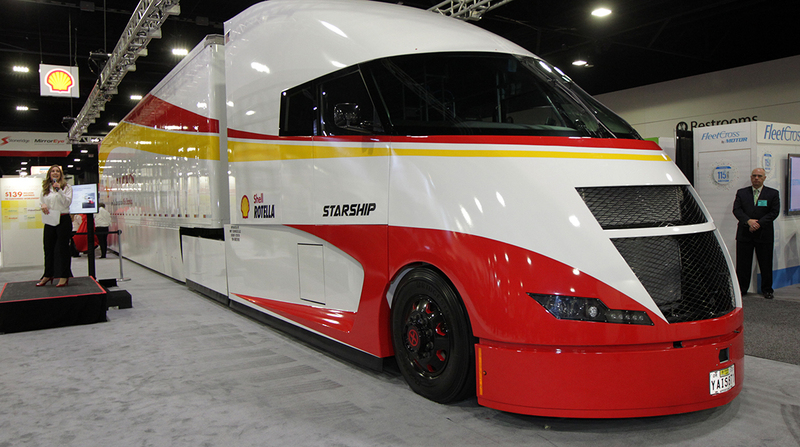 The truck will make a coast-to-coast run in May, after which Shell will announce the truck’s fuel-economy performance. Currently, it is on a tour making stops at various corporate and industry events, Pino said.